The Bluehead Wrasse is a beautiful, multicolored wrasse. Similar to many wrasse species, the Bluehead Wrasse demonstrates dramatic color variation within individuals based on gender and age. The Bluehead Wrasse experiences distinct yet fluid colour phases. The juvenile Bluehead Wrasse is generally yellow with black markings along their sides and sometimes on their fins. 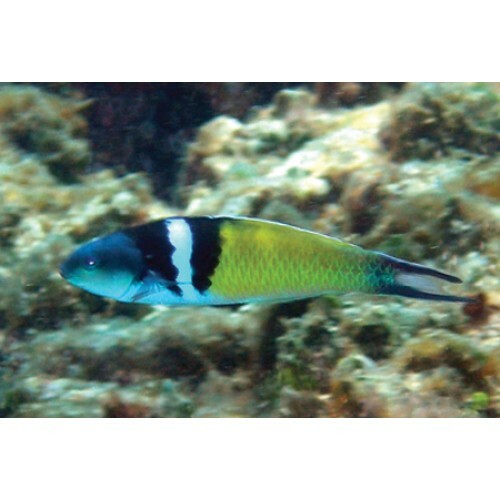 As an adult, the male Bluehead Wrasse has a bold stripe pattern (black, white, black) that divides a vibrant blue-green and yellow anterior from the namesake blue head. The female Bluehead Wrasse is completely turquoise except for two black stripes. The recommended water temperature when keeping Azure Damsel is 72-80° F (22-27° C), the pH-value should be kept in the 8.1-8.4 interval, and the specific gravity should be 1.020-1.025. A carbonate hardness of 8 - 12° dKH is ideal.